New security measure is introduced to the iTunes and App Store. 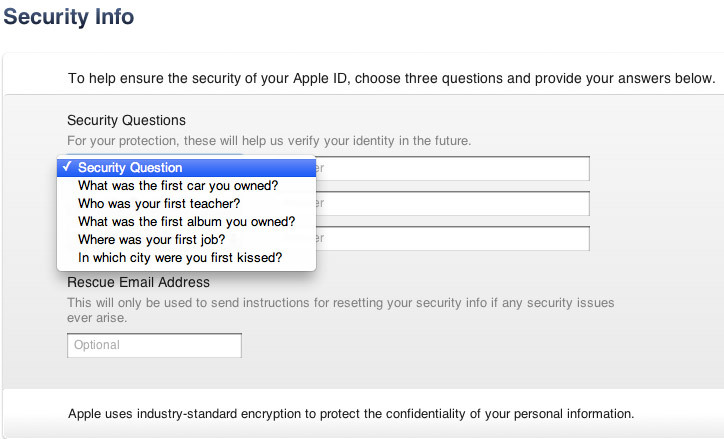 Now the customers will need to answer three security questions which can later be used to verify their identity, as reported by a thread on Apple’s Support forum. For the time being only a selected number of users are only offered to fill the online form. So we may guess that only the users who had problems in the past dealing with some security matters might have been offered the new feature. However we can be sure that other customers will also get the feature in a few weeks’ time. According to the users who have received the notice, they are already getting the questions when they are trying to download any content through the iTunes, the App Store or the iBookstore. This change has been introduced in all of the devices from Apple, so it won’t be wrong to expect it on your devices while using iTunes. So now you will need to enter answers to three questions like ‘In which city were you first kissed?’ or, where was your first Job?’ and others. These questions will be asked to the users after they were asked to enter the password. These kinds of questions are generally used by financial institutions and online entities for storing sensitive data. Till now it is not exactly sure if apple is planning the feature to be provided to all the customers or if to only those who wants this layer of security. It also seems like they will be using a rescue email address which will help the users to restore or get the forgotten answers to the questions. However, these doubts will be cleared only after any official disclosure made on this issue.